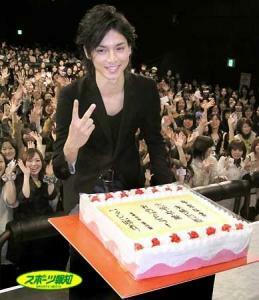 Actor Mizushima Hiro(23) appeared in Shibuya Tokyo for the handshake session for the DVD "100 Scenes of Love". Mizushima played a leading role in "Masked Rider Kabuto", and appeared in"Hanazakri no Kimitachi e Ikemen Paradise". His rising popularity brought him 4000 fans to the handshake session. He said " The fans existence brought forth the existence of Mizushima Hiro. I am really grateful doing this meaning ful job"and shook hands with careful attitudes. Also, with Mizushima's confirmeded graduation from Faculty of Environment and Information Studies in Keio Univeristy. Fan surprised him by having a cake shaped like a diploma as felicitations present which made him very happy. "My father allowed me to step into the entertainment business under one condition, that is to graduate from univeristy. And now that I have one big load off my mind." Said Mizushima. From April onwards, Mizushima will appear in a Fuji TV Serieds "Absolute Boyfriend"(Starts on April 8th, Tuesday).